SHAME – How often in addiction do we hear people say, “You should be ashamed of yourself!” or “Look what you’ve put us through!”? It is likely more often than we should. Theologically shame has been around since the first humans, Adam and Eve, roamed the lush fields in the Garden of Eden. Adam and Eve were both warned not to eat from the tree of the knowledge of good and evil and after Eve was so easily tempted by the serpent they indulged, thus resulting in the first sin. The writer of Genesis tells us “At that moment, their eyes were opened, and they suddenly felt shame at their nakedness…” (Genesis 3:7a, NLT.) Later, when they heard God, they hid (as if the all-knowing, all-powerful God could not see them.) God called out to Adam, “Where are you?” (Genesis 3:9, NLT) To which Adam replied, “I heard you walking in the garden, so I hid. I was afraid because I was naked.” (Genesis 3:10, NLT) In that very instant the sin that so easily entangled them led to the shame that is now woven into the thread of, not only this story but religion, culture, society, and even our belief system. Adam and Eve after they were banished from the Garden of Eden for disobeying God. The beginning of shame. Shame has become the mushy, pliable foundation on which we construct lies, develop secrets, and contrive facades of who we pretend to be. If unaddressed it continues to increase slowly and persistently in our psyche; establishing itself with one singular internal insult at a time. It then has the capability to cultivate itself into an incredibly sized festering monster of self-hatred, doubt, depression, and worry that will demolish everything in its path. The shame cycle states that if shame is not addressed it will continue to worsen. 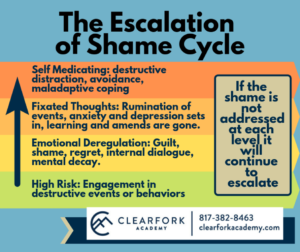 Recognizing shame within oneself is a critical part of the process to overcome the negative impact on the live’s of our clients here at Clearfork Academy. We are affording them the opportunity to step out of the Shame Matrix: Attacking Self, Avoidance, Attacking Others, and Withdrawal using a simple awareness assessment. One step for defeating shame is to “break the silence.” Becoming transparent and exposing the secrets and lies that were so flaw-fully fabricated provides open channels to gaining freedom. “Then you will know the truth, and the truth will set you free.” (John 8:32, NIV) Accepting emotions is also a pivotal part of ridding one’s life of shame. Shame is afraid of exposure, however, providing the opportunity for a client to contain their guilt while also releasing the shame can prove to be difficult if you are not prepared. Strategically, addressing shame is similar to addressing trauma and often it is directly connected to trauma. It is always expressed as a present event in its exposure. Applying an empathetic approach is the catalyst for the continued sharing of the shameful thought processes. Empathy continues to establish, confirm, and solidify the safe environment in which shameful thoughts can be revealed. Providing positive reflection of how you presently view the client should always be introduced into the process. What is good about today? What is your goal for the day? The most amazing part of asking the “3 G’s” is that the answer does not have to be eccentric or elaborate. This simple exercise teaches the client to be grateful for the small things first. They are now aware of and able to acknowledge a shared experience of receiving things of worth. More importantly, this proves to them that they are worthy recipients of positive things. Worthy enough to receive the blessings and glorious riches that can only be given by a redeeming father, God. A process that we call Belief Transformation, rather than Behavior Modification. We believe that shame becomes unbelief that materializes as a God-shaped-hole in the heart. But by applying these methods and practices we can begin to see the developmental adjustments of the belief system. In recognizing and becoming aware of shame and its damaging effects, there has to be a full transformation. Pathologizing states, “I am bad” and “Something is wrong with me” and “I screw everything up.” On the other side normalizing enforces a separation between the individual and the event, “I did a bad thing” and “I’m not the only one” and “I made a mistake this time.” This transfiguration develops and eventually becomes shame resiliency. Shame resiliency allows for a client to recognize their shame triggers (person, place, statement, or event) and see the personal vulnerabilities that led to the feelings of shame much like doing an accountability inventory. After this, they can grasp an awareness of the external forces that introduced shameful thinking into their life. Accessing empathetic support such as a mentor or sponsor then allows the individual to voice the shame (it cannot survive exposure.) This approach diffuses any avenue that shame will take to manufacture and introduce negative thoughts and feelings back into the individual’s belief system. Developing compassion for those individuals that are suffering in shame shows applied empathy and further nurtures the person’s identity. Our counselors use all of these techniques while concurrently developing the clients through teaching/education and mindfulness to show them that they can learn new acceptable behaviors to counteract the shame and other behavioral disorders. By design, over the course of 90-days the walls come down, the shame comes out and the clients are ultimately provided with a safe environment to embrace the redemptive grace of Jesus Christ and journey on to a #NewLegacy. If you know a teen that is struggling with substance abuse please contact us today at 817-382-8463 or go to our admissions tab.